Home » Heart Health » Blood Pressure » Are Your Blood Pressure Meds Causing Cancer? It turns out that the blood pressure medicine you’re on might be helping your hypertension, but it comes with another very dangerous side-effect: it may be a risk factor for breast cancer. About 67 million American adults suffer from high blood pressure—that’s one in every three American adults. This condition comes at a high price: about $47.5 billion is spent every year on the medical costs associated with high blood pressure, such as the cost of blood pressure medicine and doctor visits, plus another $3.5 billion is wasted in lost employee productivity. As the number of Americans with high blood pressure rises, so does the number of people turning to blood pressure medicine: 70% of Americans use blood pressure medicine to combat the condition. So while blood pressure medicine may be reducing your hypertension, just what else is it actually doing? According to a new study published early this week in the Journal of the American Medical Association, researchers found that long-term use of antihypertensive medications was associated with breast cancer. Why might this blood pressure medicine be a risk factor for breast cancer? To date, research has not found a conclusive link between patients who take blood pressure medicine such as antihypertensive medications and a risk of cancer (in particular, as a risk factor for breast cancer). In this recent study, researchers used a population-based case-control study in women aged 55 to 74, of which 1907 had breast cancer and 856 had no cancer (control group). Then, the researchers looked at the use of blood pressure medicine—in particular, calcium-channel antihypertensive medications. The women who were using this type of blood pressure medicine for more than 10 years had a higher risk of ductal breast cancer and lobular breast cancer. This study is the first of its kind to show that long-term use of blood pressure medicine (in particular, the calcium-channel blockers used in this study) can be a risk factor for breast cancer, but more research needs to be done to understand the association between the two conditions. If you’re currently on blood pressure medicine, and you have a higher risk of breast cancer (have a BRCA mutation, or a family history of cancer, for example), then raise the subject with your doctor. The study did note that certain types of blood pressure medicine were not shown to be a risk factor for breast cancer (diuretics, beta blockers, and antigotensin II antagonists) so ask your doctor about switching to those instead. Li, C., et al., “Use of antihypertensive medications and breast cancer risk among women aged 55 to 74 years,” JAMA Intern Med. Published online August 5, 2013. 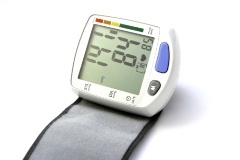 “High Blood Pressure Facts,” Centers for Disease Control and Prevention web site; http://www.cdc.gov/bloodpressure/facts.htm, last accessed August 6, 2013.